I've just changed the ignition lock on my '83 Z1000R, which was pretty straight forward, but now leaves me with 3 keys - one for the ignition, one for the seat lock and one for the helmet lock. Does anyone on here know how to remove the barrels from this style of lock or know someone who can at least reduce the helmet and seat lock into one key? can you put some pictures of those locks on the forum? Maybe I can tell you how to remove the barrels and change the inside of it to one key. I'm doing the same thing at the moment for a KZ1000P. 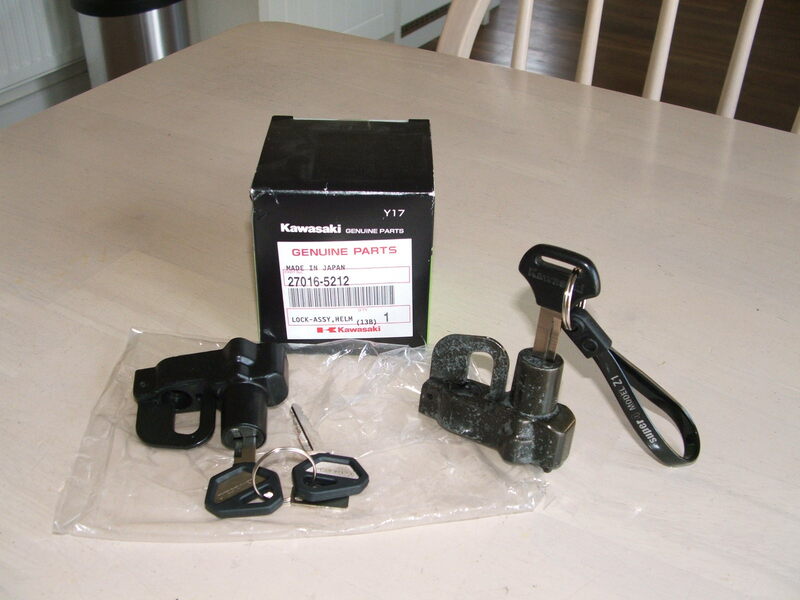 If it is anything like ZRX 1200 helmet lock it is fairly easy to do. Will try and find the link on how to do it. Helmet lock was basically take it to bits - do it in a clean area as there are some tiny springs that push the brass wafers into place. There is one large brass wafer which holds the barrel into the lock body - does not affect the key. Then there are 3-4 small brass wafers that slot into 5 slots on the barrel body (at least one slot will be empty). It is just a case of swapping the 4 wafers around until you get them right for your key ( they fit flush to barrel when key is inserted). If you are lucky you can jiggle them round and re-use all 4 wafers - if not it will work fine with just 3 wafers fitted. If you want to get really tech you could probs adjust the slot on a wafer with mini file etc. but I did it by swapping them round. Once you are happy barrel spins in body with wafers and key inserted - re-assemble in reverse order. pertonpc wrote: If it is anything like ZRX 1200 helmet lock it is fairly easy to do. Thanks for the help and the link but these barrels seem to be slightly harder to remove from the lock body. As can be seen from the addition foto the barrel is stopped from sliding forward by, what looks like, a wafer lock (slightly obscured brass coloured in the foto) and this also controls the quarter turn of the key but there is no way to remove the offending wafer. apologies for not fully grasping what the link you kindly sent said - I wasn't a ZRX forum member and hence couldn't see some of the important images earlier. Now I'm a full ZRX member I can see the images and see that I have to press the gold wafer into the barrel and hey presto the barrel drops out - oops bad choice of words. 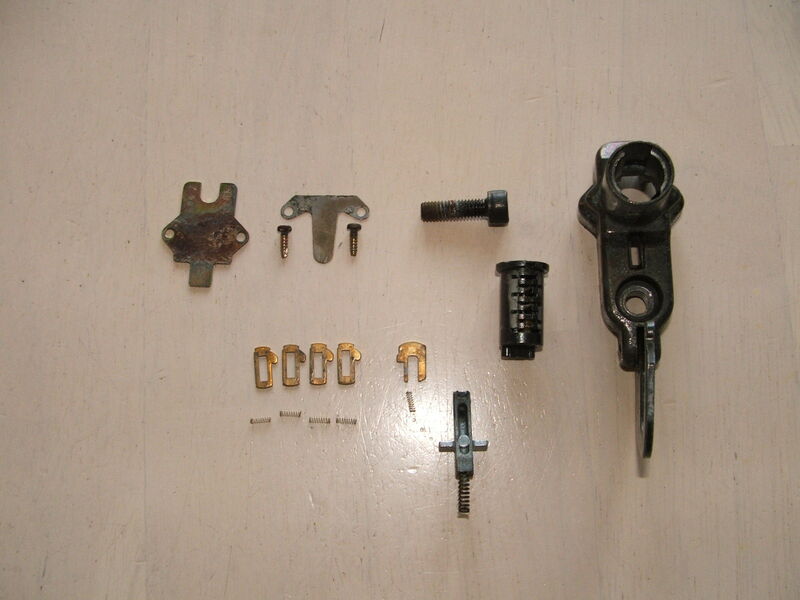 Here is my ZRX helmet lock dismantled - note the larger retaining wafer on right & the 6 slots you can choose from to make key fit. Got to get the wafers into a place where the whole lot is flush when key goes in - like this - then test it in the barrel to make sure before reassembly. Note the position of the larger retainer wafer - no effect on key action. You can see the 2 slots which I did not use - and where the 4 ended up. New part was different appearance & key style altogether so would not have matched up too good. Hope you are sorted now ?? Yes thanks Mark, all sorted on 2 keys. It was the rear view that sorted it (ooow eeeer missus) with the red grease showing the same brass locking wafer. Just needed a blade to compress the little blighter and out popped the barrel. I had some spare wafers from an old ignition switch that could be filed. 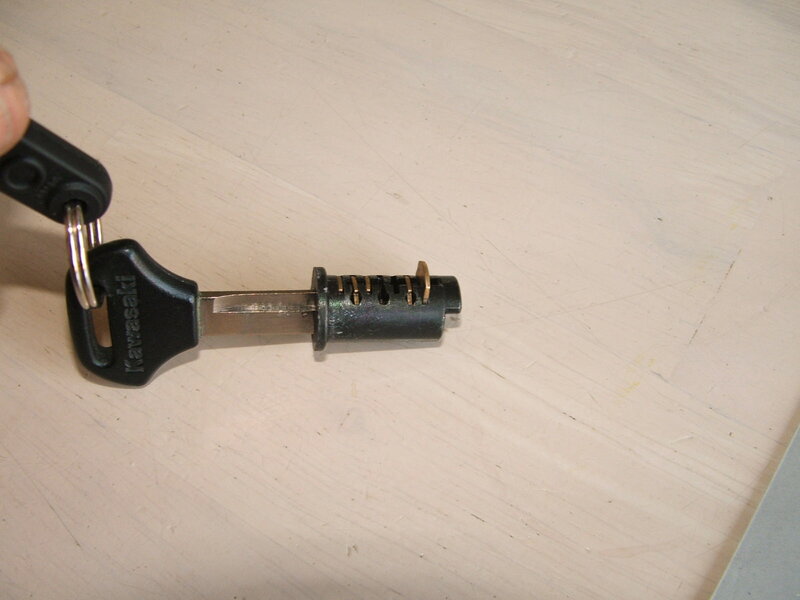 I've got an old helmet lock that, now I know how to release the barrel, I can make to suit the Z5488 key I have leftover. just noticed that you allready got help from Mark! That's why there's a forum. We help eachother! The other lock might be more difficult but the basics are the same. The hardest part is to get the barrel out. Unscrew the back plate and find the retaining part to get the barrel out. Afterwards it's the same as the other lock. Thanks Philippe, fortunately I set the helmet lock to the seat lock key so didn't have to investigate further, as the locking wafer wasn't easily accessible. I might have a spare, with a kwaki key, that I'd part with. I bought the new one photographed as I didn't know how to change the wafers. I'll put a few fotos up if you're interested?